No one wants credit card debt. See how one fintech startup hopes to fix that. Why this credit card startup wants to look out for your financial future. It's 2019, and making a purchase is easier than ever. Swipe your card, click a few buttons, or simply say what you want in close proximity to your phone. You will find it – don’t worry. There’s no doubt these features are convenient, but they can also leave you with financial consequences. According to Wallethub’s credit card debt study, many felt these consequences hard. In 2018, they found that the average amount of credit card debt was $8,284 per household. It’s crucial to build your credit score (which comes in handy if you ever plan on buying a house, owning a car, or even just getting off the family cell phone plan). But racking up a slew of charges and not paying for them on time can lower your newly-existing credit score, hurt your chances to further get more credit, and may ultimately leave you swimming up to your neck in debt. At the end of the day, you can’t just build your credit score, but you must build your credit score responsibly. That’s where Petal comes in. Petal is a new startup aimed at making the credit card industry better with a modern and intuitive credit card experience and mobile app. Instead of solely relying on credit history to make a decision, Petal also takes into consideration the money you make and the bills you pay, with a machine-learning process called cash-flow underwriting. 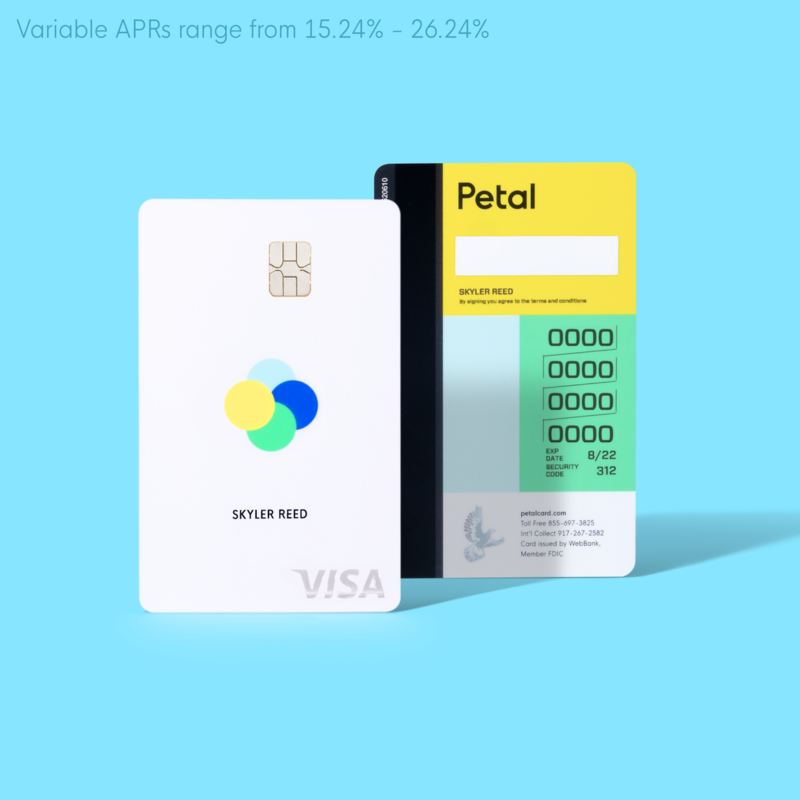 This technology allows Petal to help give more people access to build credit with a card that has higher limits, competitive rates, and no fees whatsoever, with variable APRs ranging from 15.24% to 26.24%. Petal provides access to a Visa credit card in partnership with WebBank, Member FDIC, along with a simple, modern experience designed to help you keep your credit usage under control while building your credit score. How is the Petal Visa credit card different than other credit cards? A lot of companies say they’re different, when in reality, they have little to show for it. But Petal IS different. They’re re-imagining the role of the credit card: not a means for short-term splurging, but a tool for your financial success. And, instead of being overlooked for not having a credit history, Petal provides a greater opportunity for consumers to start building one. You can even see if you are pre-approved without any impact to your credit score before officially submitting your application by visiting Petal’s website. With Petal, you can qualify for a credit limit anywhere from $500 up to $10,000, which may be a game changer if new to the credit world. This makes it easier to keep your utilization low – which is an important factor that influences your credit score. But here’s the best part: You don’t need to worry about paying an annual fee, late payment fee, or foreign transaction fee, because there are no fees with the Petal credit card, whatsoever. Petal’s mobile app for iOS and Android makes it easy to track your spending and manage your money. One key feature is the interest slider, which helps you predict how much interest you will pay each statement cycle when you choose to carry a balance. Understanding how much it will cost you to hold a balance can help you make a more informed financial decision. The app also lets you link other credit card, checking, and financial accounts to the dashboard, so you can see your full financial picture all in one place. If you’re looking for a company that looks out for your financial future, you might want to check out Petal. Just six months of on-time payments can significantly build up your credit score. You can learn more about Petal to see if they’re right for you by visiting their website at Petalcard.com.